It's possible for bad things to happen in life, things that are so bad you want to remake your identity and leave behind everyone you have ever loved. Grief is powerful. 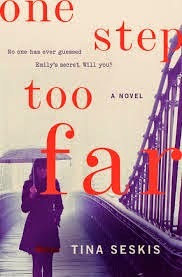 That's the premise behind Tina Seskis's One Step Too Far...Emily has left behind her family to try to figure out how to live in the wake of her grief and horror over what her life has become. The books alternates between Emily's history and her present as her newly made life unravels much as her old life did. Whenever you read this kind of book, there's always the worry that "the secret" cannot possibly be bad enough to justify all the behavior and build-up that leads to it. And I did think there was just a tiny bit of deception at play in this one in order to preserve the reveal. I won't go specifically into what it was as I don't want to spoil anything, but that did irritate me slightly. But I actually did think the secret when revealed was pretty awful. It's the sort of thing that on the surface of it feels unforgiveable but deep down maybe we see exactly how it could have happened. And that closeness is terrifying in its own way. The book stayed with me long after I finished it. Recommended.